The first phase of the competition brought together more than one hundred and fifty concepts of teams all over the world. 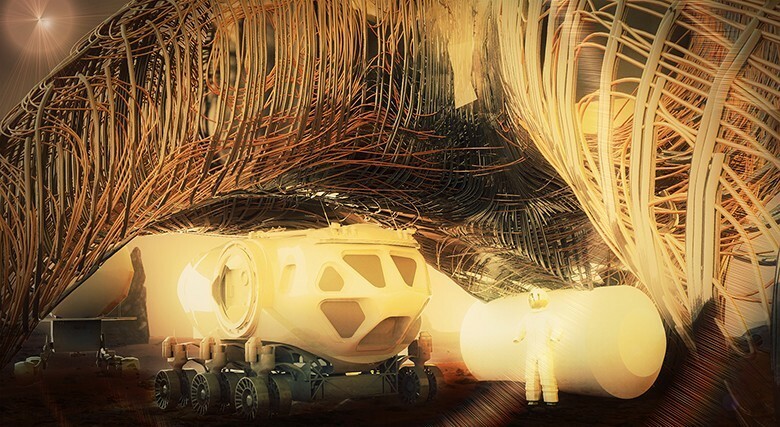 Their task was to design a 100 m2 habitat which would be able to accommodate living and research facilities as well as life support equipment for 4 astronauts, built through the use of 3D printing technology using indigenous resources. Thirty of the best, selected for the second phase, included the concept of the Hybrid Composites team from the studio of architecture and design Ozel Office. Their project took the fourth place with the title Runner-Up. The head of the team is Guvench Ozel, who is an architect, lecturer, and scientist from the University of UCLA in Los Angeles. The interests of his team include robotics in architecture and the use of composite materials in 3D printing. The interests of his team include robotics in architecture and the use of composite materials in 3-D printing. Unlike the concepts of several competitors’ teams that offered to 3D print concrete-like shells through the use of local regolith, Hybrid Composites decided to construct high-performance composite shells by using locally harvested composite basalt fibers and fast curing polymers that react to heat or UV light. We can say, this is a 3D version of how modern high-quality ships, aircraft, satellites and spaceships are built. Primary composite fiber is extruded from basalt rocks of igneous origin, and then the structural systems and shell enclosures can be 3D printed through robotically controlled mandrel systems in conjunction with a novel resin/polymer catalyst that instantly cures. If special technological requirements need to be met, conductive metal fibers, fiber optics and other fibers that transmit electricity, data and light can be woven into the composites at designed locations. 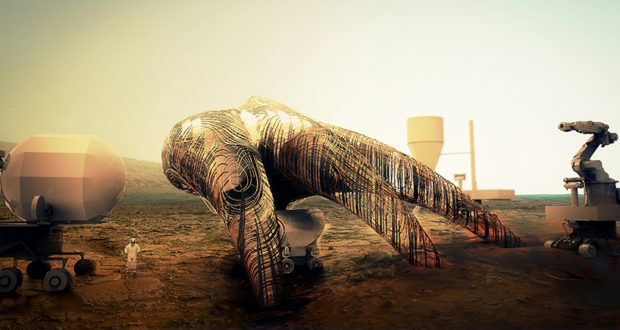 Through the proposed material and fabrication techniques, the habitat will be a combination of a 3D printed composite lattice that is extruded through robotic arms, serving as structure, and inner layers of robotically formed composite shells as high-performance enclosures. In addition to the Hybrid Composites from Ozel Office, a few more teams have focused on using basalt fiber for the Mars habitats. The project Donut House Mk. I from A.R.C.H. team is among them. They suggested building eco-friendly, low-cost houses both on the Earth and beyond out of basalt fiber reinforced clay. This project was awarded the title Best in Class: Best Technical Proposal. The first phase of the contest is completed, the winners are announced, and the Prize is awarded. The second phase of the competition has been started. The first level of the second phase – The Structural Member Competition focuses on the fabrication technologies needed to manufacture structural components from a combination of indigenous materials and recyclables, or indigenous materials alone. The On-Site Habitat Competition (Level 2) challenges competitors to fabricate full-scale habitats using indigenous materials or indigenous materials combined with recyclables. Two main prizes will be awarded to the winners, each equals $ 1.1 million.